Khat the Bishop worked closely with St. Nerses the Great. Like Nerses he had great passion for social issues, especially helping the poor. 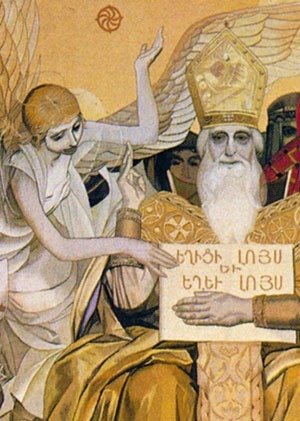 Nerses entrusted most of the benevolent work of the church to Khat. He is so closely associated with St. Nerses that the church honors them on the same day. By the light of unspeakable grace of your divine knowledge you arose on the land of Armenia, merciful heavenly Father; have compassion on us who have sinned. Saint Nerses, pure in soul, from birth you were chosen to inherit the paternal lot of shepherding righteously and lawfully. You adorned the Church with the laws of truth and established good order within it; through his prayers have mercy on us, O Christ. This Saturday, October 29, the Armenian Church commemorates and remembers St. John Chrysostom (Hovhan Vosgeperan), a notable Christian bishop and preacher in Syria and Constantinople. He is famous for his eloquence—Chrysostom means “golden mouth.” The Orthodox Church honors him as a saint and one of the “three holy hierarchs” (along with Basil the Great and Gregory the Theologian). He is also recognized and honored by the Catholic Church and the Church of England. His outspoken criticism was not appreciated by the hierarchy and he was sent into exile at various times. He had a profound influence on the doctrines and theology of the Armenian Church because he spent the final years of his exile in Armenia. Some of his important works have survived only in Armenian manuscripts. Muse of the deep and ineffable Divine Mysteries. Like the rock of the Church, you were faithful to the key to heaven. From the beloved disciple, you received the gospel. From the Holy Virgin Birthgiver you received your symbol of authority. O Patriarch John, by the grace of the Holy Spirit you received wisdom. This Saturday, October 8, the Armenian Church commemorates the Feast of the Holy Translators, one of the most beloved feasts. There are, in fact, two such commemorations in our liturgical calendar. One is on the Thursday following the fourth Sunday after Pentecost, which can occur in June or July; the other is on the second Saturday of October. The October commemoration focuses on the creation of the Armenian alphabet (406) and on the accomplishments of the Holy Translators. Mesrob Mashdots, the founder of the alphabet, and Catholicos Sahag, together with some of their students, translated the Bible. Schools were opened and the works of world-renowned scholars were translated. Their work gave the Armenian Church a distinct national identity. In modern times the entire month of October has been designated as a “Month of Culture.” Armenians throughout the Diaspora and Armenia mark this with cultural events not only in remembrance of the past, but in celebration of modern-day scholars, theologians, writers, and translators. Specifically remembered this Saturday along with Mesrob and Sahag, are: Yeghishe, a renowned student of Sahag and Mesrob, who served as secretary to Vartan Mamigonian and who wrote the great history of the Vartanantz wars; Movses of Khoren, another student of Sahag and Mesrob, who is revered as the father of Armenian history; David the Invincible, a student of Movses, received most of his education in Athens, where he was given the title “Invincible” because of his brilliance in philosophy; Gregory of Nareg, who is considered the greatest poet of the Armenian nation and its first and greatest mystic; and Nerses Shnorhali, a great writer, musician, theologian, and ecumenist. The holy translators, like stewards, were interpreters of the divine Scriptures by inventing letters by means of which are preserved on earth as living words for the shepherd flock of the New Israel, praise God with a sweet sounding hymn. They looked on the greatness of earthly glory as on darkness and having put their hope in the immortal bridegroom they were made worthy of the kingdom of heaven; praise God with a sweet-sounding song. By the power of the Father’s wisdom the uncreated existing One by means of their translation they made firm the throne of Saint Gregory, praise God with a sweet-sounding song. Saint Sahag having dressed in the new word, the holy scriptures, adorned the Armenian churches, praise God with a sweet-sounding song.